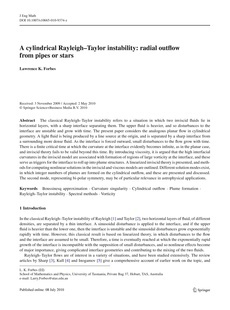 The classical Rayleigh–Taylor instability refers to a situation in which two inviscid fluids lie in horizontal layers, with a sharp interface separating them. The upper fluid is heavier, and so disturbances to the interface are unstable and grow with time. The present paper considers the analogous planar flow in cylindrical geometry. A light fluid is being produced by a line source at the origin, and is separated by a sharp interface from a surrounding more dense fluid. As the interface is forced outward, small disturbances to the flow grow with time. There is a finite critical time at which the curvature at the interface evidently becomes infinite, as in the planar case, and inviscid theory fails to be valid beyond this time. By introducing viscosity, it is argued that the high interfacial curvatures in the inviscid model are associated with formation of regions of large vorticity at the interface, and these serve as triggers for the interface to roll up into plume structures. A linearized inviscid theory is presented, and methods for computing nonlinear solutions in the inviscid and viscous models are outlined. Different solution modes exist, in which integer numbers of plumes are formed on the cylindrical outflow, and these are presented and discussed. The second mode, representing bi-polar symmetry, may be of particular relevance in astrophysical applications.